Syria will start handing over information on its chemical weapons to international groups a month after it signs the Chemical Weapons Convention, President Bashar Assad has told a Russian TV channel. Damascus has agreed to a Russia proposal to put its chemical weapons stockpiles under international control. Within days Damascus promises to submit to the United Nations all documents required for joining the chemical weapons ban treaty. A month after Syria signs the Chemical Weapons Convention it will start handing over information on chemical weapons to international organizations. “I believe the agreement will come into force a month after the signing and Syria will start submitting data on its chemical weapons stockpile to international organizations. These are standard procedures and we are going to stick to them,” he said. Meanwhile, the UN says that it has received a letter from Syria on the country’s intention to join the treaty banning the production of chemical arms, their stockpiling and use. The Syrian government’s letter of accession is being translated, AP cited UN associate spokesman Farhan Haq as saying Thursday. Signing the letter accession begins the process for a country to become party to the international agreement, the official said. 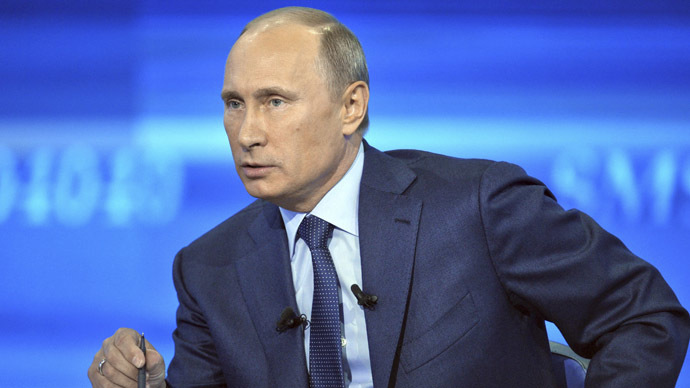 “It doesn’t mean that Syria will sign the documents, fulfill the obligations and that’s it. It’s a bilateral process aimed, first of all, at making the US stop pursuing its policy of threats against Syria,” Assad said, adding that a lot would also depend on the extent to which Russia’s proposal is accepted. 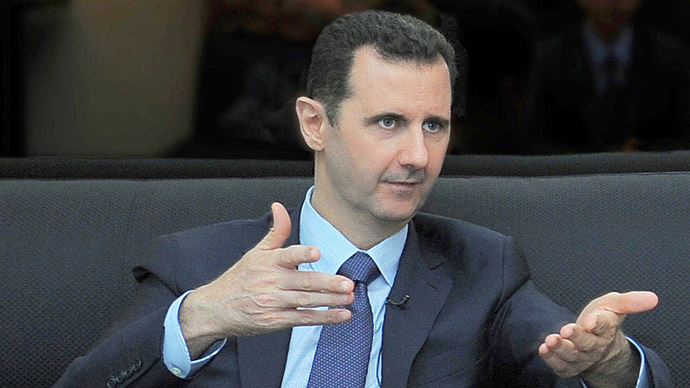 “Terrorists are trying to provoke American strike against Syria,” Assad said. Rebel forces are receiving chemical weapons from abroad, he added. Countries that provide “terrorists” with chemical weapons should be held accountable, Assad said. “We should thoroughly investigate the [chemical weapons used in the attack] to discover their components and which side used them,” Assad said. Both the Syrian government and rebel forces have blamed each other for the chemical weapon attack in a Damascus suburb on August 21. Talking to the Russian TV channel, Assad reiterated that the US has failed to present evidence that the Syrian government was behind the incident. No country in the Middle East, including Israel, should possess weapons of mass destruction, Assad said. That would protect the region and the world from devastating and expensive wars in future, he said. The president recalled that a project on the elimination of WMD had been proposed, but the US opposed it “to allow Israel” to have such weapons. Any kind of a war against Syria would “destroy the entire region” and lead to decades of instability in the Middle East, Assad said. “Syria is making serious efforts so that our country and other states in the region will not be involved in a new crazy war that some proponents of the war in the US are trying to unleash in the Middle East,” he said. Earlier in the week, RT, citing unnamed sources, reported that rebels could launch a chemical attack on Israel from government-controlled territories as a “major provocation.” Assad did not rule out such a scenario. Toxic agents “were used against Syrian Army soldiers and civilians” and that therefore rebel forces did have these weapons, he said. “Everyone is aware that terrorist groups and those who control them are trying to provoke an American strike. Earlier, they attempted to draw Israel into the Syrian crisis,” Assad said. On Monday, as the White House was pushing for congressional approval of the military strike against the Syrian regime, Russia’s Foreign Minister Sergey Lavrov urged Damascus to put its stockpile of chemical weapons under international control. 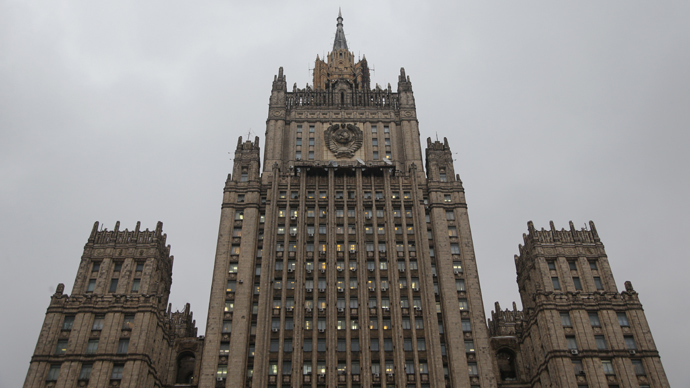 Moscow also called on the Syrian government to join the Organization for the Prohibition of Chemical Weapons. Syria accepted the proposal and agreed to sign the Chemical Weapons Convention. Moscow’s initiative was also welcomed in Washington. President Barack Obama urged the US Congress to postpone a vote to authorize military action, and said he was seeking a diplomatic solution to the Syrian conflict. 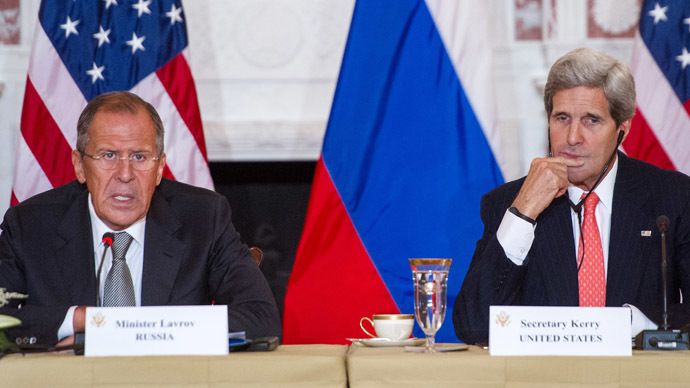 US Secretary of State John Kerry and Russia's foreign minister, Sergey Lavrov, accompanied by groups of experts, are scheduled to meet in Geneva late Thursday to discuss in detail Moscow's plan to dispose of Syrian chemical weapons.